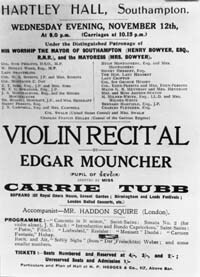 Although I have always had a great admiration for the two musicians presented in this article on Edgar Mouncher, and the one to follow on Eda Kersey, it was not until I started research in some depth that I discovered Eda Kersey, as a child of 11 years or so, was a pupil of Edgar Mouncher, perhaps his most brilliant. This important link between the two artists makes for fascinating conjecture. As far as can be ascertained Edgar Mouncher’s family are of Huguenot stock. Edgar’s father, Frederick, was as a boy entered into an apprenticeship for seven years with Messrs. Buchan & Son, 159 High Street, Southampton to become a gilder. Wages for the first year 1871 was one shilling a week rising to nine shillings and sixpence a week in the seventh year. Food for thought here! He eventually conducted his own business as a picture restorer from premises in Bedford Place, Southampton. Edgar’s love for paintings and art in general stems from his father’s influence and from the large collection of fine paintings and prints he inherited. Many of these of local interest by such artists as David Law, Frederick Lee Bridell, and the like, Anthea, Edgar’s youngest daughter, carries on his tradition, and is an artist of great ability in her own right to this very day. 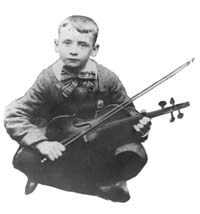 Edgar Mouncher was very young when introduced to his first violin, as the early photograph of him shows, the violin being nearly as large as himself! I suspect his first lessons would have been to pluck the instrument ‘guitar-wise’, which was fairly common practice then. I can’t imagine he at this age being able to cope with the violin under his chin; on the other hand the bow he is holding seems to be part of him. This charming portrait is from a larger photograph, which includes his mother, father, three brothers and sister. His first known teacher was Mr. Charles Fletcher of Bournemouth. Besides being an excellent instructor he was a little eccentric; he also had a very good eye for violins, and during his lifetime acquired many fine instruments, including some of the work of Stradivari. It is said that at his death his estate consisted of ‘fiddles and debts’, let’s hope one cancelled the other out! Edgar was studying with Charles Fletcher right up until 1909 when he was one of only three English students accepted into the Meisterschule Class of Professor Otakar Sevcik in Vienna. For that year his talent, even at this time must have been very considerable as Professor Sevcik, who died in 1934 at the age of 82, only undertook to teach pupils with great potential. The entrance examination demanded a very advanced technique the full complement of scholars was seldom met. Most of the great violinists of that period emanated from the Meisterschule at the Imperial Royal Academy in Vienna - such artists as Jan Kubelk, Marie Hall, Daisey Kennedy, Emanuel Ondricek and Kocian. Jan Kubelk by this time was perhaps the greatest violinist in the world, and frequently returned to give recitals and encouragement to the current students at the Academy and always to keep in touch with is beloved teacher. Edgar would have been in the company of these giants and no doubt gained tremendously from the hothouse environment in which all talent thrived and blossomed. A civic reception was given to Edgar Mouncher prior to the first of two recitals given in the Hartley Hall, Southampton. The announcement for the second one is reproduced here. The patronage and choice of programmes is indeed very impressive. Lady Swathling and W. F. G. Spranger the former owner of Tudor House being but two of the dignitaries who gave their support to Edgar’s talents. Press reports state that these recitals were received with much enthusiasm, the violinist being given a standing ovation. At this time he was giving concerts all over the South of England. Extracts from press reports are united in their praise of his virtuosity and interpretation, “The finest performance since Kreisler,” said the Southampton Times. Soon after his first English success he was found to be consumptive, the extent of which barred him from war service. From now on he was always rather conscious of his well-being. There is no doubt that his health and the l914-18 war meant no concert development was feasible, and his talents, although exercised for the benefit of the home front to the limit of his ability, were severely curtailed. 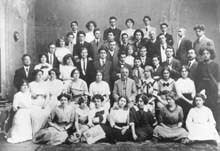 By 1919 the face of Europe had changed; even Fritz Kreisler with his worldwide reputation found the comeback hard going, due, in his case, to nationality grounds. In spite of these setbacks, Edgar continued to establish himself as a concert violinist, also devoting himself to a little teaching. He entered the field of chamber music with the foundation of the Hampshire Chamber Music Players, being joined by Elsie Hankins, piano, and Samuel Clifford, cello. A successful concert by this trio is reported in the Dorset Echo May, l929. During this period a Symphony Orchestra was brought into being. For the short time it existed Edgar Mouncher led this ensemble. The conductor was Sir Thomas Beecham. I understand that one of the reasons for its early demise was Sir Thomas’s tantrums, and his ability to spend other people’s money. The orchestra consisted of 70 local musicians; it was an event in connection with “Dickens Week”, and incidentally it also enabled Sir Thomas to expand on his project, “The Imperial League of Opera.” The idea behind this was to bring opera to every provincial town as on the continent. He gave the audience something of a lecture on his pet subject, the results of which, I am sorry to say, fell on stony ground. Edgar Mouncher was no exception in taking this step, as many great teachers for one reason or another gave up their public playing relatively early to devote their talents to teaching. Professor Sevcik, Leopold Auer, and in London the much respected Sascha Lasserson come to mind. To digress a moment, it is impossible in the final analysis to say who gives most to music - the teacher who has sacrificed his playing career to pass on his skills and knowledge, or the concert artist who gives to the public the end product, for both are equally important if music is to become a living art, rather than remain in the rarefied atmosphere of pure theory. Edgar Mouncher and Eda Kersey, the subject of a companion article, are excellent examples of these two aspects of music as a live art. During the few years he was Professor of violin at Wellington College, Somerset, Edgar Mouncher was starting on a teaching project, which must be something of a record. A studio over Teagues music shop in Ryde, Isle of Wight, he kept going for close on 40 years, together with studios in Southsea, Bournemouth, London and other towns; and for most of this time, in addition to these commitments, he also taught at King Edward V1 and Taunton’s School, Southampton, and Byculla School Petersfield. These were busy times and due to the quality of his teaching were very happy and rewarding ones. Among his early Isle of Wight students was Gordon Creighton whose name stands out. 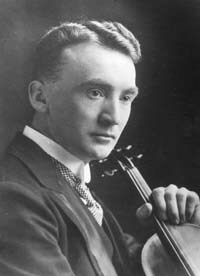 As a boy he received his violin and viola training from Edgar Mouncher and carried the torch for the Sevcik method throughout his long career, Gordon Creighton’s granddaughter, Joanna, now 17 years old, is an excellent example of the thin, but very strong line of traditional teaching being kept intact through the generations. This is not to say that string teaching techniques do not change. They do, but the fundamentals remain, and are still the core of good instruction. There is no doubt that Edgar’s ‘claim to fame’ was his ability through the medium he knew best, music, to fire the imagination of his friends and pupils in a way that left them asking for more. Edgar Mouncher’s teaching method relied heavily on his playing with the pupil, at the same time keeping an eye on every movement; immediately anything went astray he was able to analyse and correct it. The Sevcik manual was in constant use. It still is today and is of incalculable value for technique and a cornerstone of violin teaching literature. I consider it a privilege to have had Edgar as a friend and mentor for so many years, from 1946 until his death in 1970. The serious side of his nature belied a sense of humour which when roused made his company most enjoyable. It was on this basis that we got on so well together. I confess I was envious of his copperplate handwriting and his command of the Teutonic tongue. Tallish and distinguished, he had the air of a professor about him as indeed he was to his pupils. Right at the beginning of our friendship he introduced me to his London friend a violin dealer, Arthur Dykes, a man with immense knowledge at his command on violin matters. For me this was an exciting experience and adding great impetus to my career. 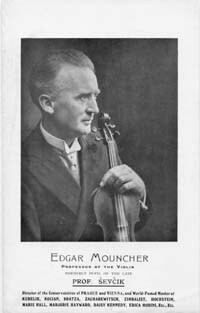 Edgar Mouncher, always modest, claimed he knew little about violins except how to play them! To some extent this was true, but he was being too modest as, in my experience, his knowledge was considerable. His love for the fine violins of the past knew no bounds, as was his encouragement to modern makers, including myself. At the family home in Belmont Road, Portswood, Southampton, there was always a warm welcome, usually from his wife, Muriel. On entering the hall one came face to face with a beautiful portrait in oils of a girl playing a Cittern. The provenance of this masterpiece reveals that it was at one time in the collection of Nicolo Paganini, the subject of a recent article in the Hampshire Magazine. This painting had for me a special fascination. Some of the most interesting subjects in the “Mouncher Collection” adorned the drawing room walls, including a lovely matching pair of paintings by William Shayer Sen., works of Birket Foster and two water colours by Frederick Lee Bridell, of which he was particularly fond. Frederick Lee Bridell (1830-1863) was one of Southampton’s finest painters. Also in the collection was a Daguerreotype of F. Lee Bridell and many prints of old Southampton. Edgar was very proud of his hometown and always enjoyed chatting about it in relation to the prints in the collection: another reason why we were on the same wavelength. During the summer vacation it was Edgar’s great pleasure to clean, care and check that all was well with his beloved paintings. I well remember seeing over 150 prints laid out for ‘annual’ inspection. This was how he liked to spend his time, very rarely taking a holiday in the customary way. Muriel, his wife received violin tuition from her husband before and after they were married so that she was very capable and qualified to teach the younger pupils as they came along. Robert Bower, a close friend and adviser on violin matters, played an important role in his life, Robert Bower is best described as a ‘gentleman dealer’: he only handled the cream of the Cremonese school of violin making, and in spite of his wealth he always cycled his way around London - a sensible chap! It was through him and Arthur Dykes that Edgar gained knowledge and passed so much on to me. Edgar’s admiration for the finest in the Italian violins is manifest in that he named his house ‘Cremona’. Inevitably many fine instruments passed through his hands, if only on the way to his pupils. It is a certainty that he was able to spot quality when it came to hand. His parental training in the world of art made certain of this. Two violins carried him through this career. The first was made by William Voller in London c.1890, a very fine copy of a particular Stradivari, purchased from his old teacher Charles Fletcher, who insisted he never sold it while in Vienna, as he was sure an unscrupulous dealer would pass it off as genuine. This was sold at the end of his career, together with his other violin, a fine example of the work of Alessandro Gagliano made in Naples and dating from 1725. It was purchased with the help of his friend Robert Bower in 1919. He was justly very proud of his lovely example of the Italian Luthier’s art. Both instruments now have good homes. Over the years he brought together a small collection of bows. Two very fine examples by Eugene Sartory (1871-1946) and James Tubbs (1835-1921) come to mind. Reasonably priced then, but very expensive now! It is teachers like Edgar Mouncher that we have to thank for their work in bridging the period between the early school of the violin teaching in the 1860’s and the present amazingly high standards set by the young performers of the present generation. I have to thank Edgar’s wife, Muriel and his daughter Anthea for their valuable contribution to this profile of one of Hampshire’s leading exponents in the art of music.